Insulinomas are the most common cause of hypoglycemia resulting from endogenous hyperinsulinism. Approximately 90-95% of insulinomas are benign, and long-term cure with total resolution of preoperative symptoms is expected after complete resection. See the image below. CT scan image with oral and intravenous contrast in a patient with biochemical evidence of insulinoma. The 3-cm contrast-enhancing neoplasm (arrow) is seen in the tail of the pancreas (P) posterior to the stomach (S) (Yeo, 1993). Failure of endogenous insulin secretion to be suppressed by hypoglycemia is the hallmark of an insulinoma. Thus, the finding of inappropriately elevated levels of insulin in the face of hypoglycemia is the key to diagnosis. In 1927, Wilder established the association between hyperinsulinism and a functional islet cell tumor. In 1929, Graham achieved the first surgical cure of an islet cell adenoma. Insulinomas can be difficult to diagnose. It was not uncommon for patients to have been misdiagnosed with psychiatric illnesses or seizure disorders before insulinoma was recognized. An insulinoma is a neuroendocrine tumor, deriving mainly from pancreatic islet cells, that secretes insulin. Some insulinomas also secrete other hormones, such as gastrin, 5-hydroxyindolic acid, adrenocorticotropic hormone (ACTH), glucagon, human chorionic gonadotropin, and somatostatin. The tumor may secrete insulin in short bursts, causing wide fluctuations in blood levels. About 90% of insulinomas are benign. Approximately 10% of insulinomas are malignant (metastases are present). Approximately 10% of patients have multiple insulinomas; of patients with multiple insulinomas, 50% have multiple endocrine neoplasia type 1 (MEN 1). Insulinomas are associated with MEN 1 in 5% of patients. On the other hand, 21% of patients with MEN 1 develop insulinomas. Because of the association of insulinomas with MEN 1, consideration should be given to screening family members of insulinoma patients for MEN 1. Group C – Very low rates of insulin secretion and virtually no response to stimuli (including high CaCl 2 concentration) and inhibitors (with CaCl 2 omission paradoxically stimulatory). Increased expression of the phosphorylated mechanistic target of rapamycin (p-mTOR) signaling pathway and its downstream serine/threonine kinase p70S6k has been observed in insulinoma tumor specimens. This discovery has led to studies exploring mTOR inhibitors as new therapeutic options. Insulinomas are the most common pancreatic endocrine tumors. The incidence is 3-10 cases per million people per year. These make up 55% of neuroendocrine tumors. Exact data for international incidence of insulinomas are not available. One source from Northern Ireland reported an annual incidence of 1 case per million persons. A study from Iran found 68 cases in a time span of 20 years in a university in Tehran. A 10-year single-institution study from Spain of 49 consecutive patients who underwent laparoscopic surgery for neuroendocrine pancreatic tumors included 23 cases of insulinoma. These reports may be an underestimate. Pancreatic fistula is the most common complication of surgery for insulinoma,  with a Other complications associated with surgery for insulinoma surgery include pseudocyst, intra-abdominal abscess, pancreatitis, hemorrhage, and diabetes. The postoperative mortality rate in another series of 117 insulinoma patients was 7.7%. The median survival in metastatic disease to the liver ranges from 16-26 months. Insulinomas have been reported in persons of all races. No racial predilection appears to exist. The male-to-female ratio for insulinomas is 2:3. The median age at diagnosis is about 47 years, except in insulinoma patients with MEN 1, in whom the median age is the mid 20s. In one series, patients with benign disease were younger (mean age of 38 y) than those with metastases (mean age of 52 y). The age range for peak incidence of insulinoma is between 30 and 60 years. Vinik A, Feliberti E, Perry RR, De Groot LJ, Chrousos G, Dungan K, et al. Insulinomas. July 3, 2017. [Medline]. [Full Text]. Kirkeby H, Vilmann P, Burcharth F. Insulinoma diagnosed by endoscopic ultrasonography-guided biopsy. J Laparoendosc Adv Surg Tech A. 1999 Jun. 9(3):295-8. [Medline]. McLean A. Endoscopic ultrasound in the detection of pancreatic islet cell tumours. Cancer Imaging. 2004 Mar 29. 4(2):84-91. [Medline]. Zhu L, Xue H, Sun Z, Li P, Qian T, Xing X, et al. Prospective comparison of biphasic contrast-enhanced CT, volume perfusion CT, and 3 Tesla MRI with diffusion-weighted imaging for insulinoma detection. J Magn Reson Imaging. 2017 Apr 17. [Medline]. Nockel P, Babic B, Millo C, Herscovitch P, Patel D, Nilubol N, et al. Localization of Insulinoma Using 68Ga-DOTATATE PET/CT Scan. J Clin Endocrinol Metab. 2017 Jan 1. 102 (1):195-199. [Medline]. Fernandez-Cruz L, Blanco L, Cosa R, Rendon H. Is laparoscopic resection adequate in patients with neuroendocrine pancreatic tumors?. World J Surg. 2008 May. 32(5):904-17. [Medline]. Phan GQ, Yeo CJ, Hruban RH, et al. Surgical experience with pancreatic and peripancreatic neuroendocrine tumors: review of 125 patients. J Gastrointest Surg. 1998 Sep-Oct. 2(5):472-82. [Medline]. Mathur A, Gorden P, Libutti SK. Insulinoma. Surg Clin North Am. 2009 Oct. 89(5):1105-21. [Medline]. Henquin JC, Nenquin M, Guiot Y, Rahier J, Sempoux C. Human Insulinomas Show Distinct Patterns of Insulin Secretion In Vitro. Diabetes. 2015 Oct. 64 (10):3543-53. [Medline]. [Full Text]. Zhan HX, Cong L, Zhao YP, Zhang TP, Chen G, Zhou L, et al. Activated mTOR/P70S6K signaling pathway is involved in insulinoma tumorigenesis. J Surg Oncol. 2012 Dec. 106(8):972-80. [Medline]. Dadan J, Wojskowicz P, Wojskowicz A. Neuroendocrine tumors of the pancreas. Wiad Lek. 2008. 61(1-3):43-7. [Medline]. Larijani B, Aghakhani S, Lor SS, Farzaneh Z, Pajouhi M, Bastanhagh MH. Insulinoma in Iran: a 20-year review. Ann Saudi Med. 2005 Nov-Dec. 25(6):477-80. [Medline]. Shin JJ, Gorden P, Libutti SK. Insulinoma: pathophysiology, localization and management. Future Oncol. 2010 Feb. 6 (2):229-37. [Medline]. [Full Text]. Kuzin NM, Egorov AV, Kondrashin SA, Lotov AN, Kuznetzov NS, Majorova JB. Preoperative and intraoperative topographic diagnosis of insulinomas. World J Surg. 1998 Jun. 22 (6):593-7; discussion 597-8. [Medline]. Dizon AM, Kowalyk S, Hoogwerf BJ. Neuroglycopenic and other symptoms in patients with insulinomas. Am J Med. 1999 Mar. 106(3):307-10. [Medline]. Schmitt J, Boullu-Sanchis S, Moreau F, Drui S, Louis B, Chabrier G, et al. Association of malignant insulinoma and type 2 diabetes mellitus: a case report. Ann Endocrinol (Paris). 2008 Feb. 69(1):69-72. [Medline]. Ruby RJ, Armato JP, Pyke C, Peters AL. GLP-1 provoked severe hypoglycemia in an individual with type 2 diabetes and a benign insulinoma. Diabetes Care. 2014 Aug. 37 (8):e177-8. [Medline]. Hrascan R, Pecina-Slaus N, Martic TN, Colic JF, Gall-Troselj K, Pavelic K. Analysis of selected genes in neuroendocrine tumours: insulinomas and phaeochromocytomas. J Neuroendocrinol. 2008 Aug. 20(8):1015-22. [Medline]. Bhatti TR, Ganapathy K, Huppmann AR, Conlin L, Boodhansingh KE, MacMullen C, et al. Histologic and Molecular Profile of Pediatric Insulinomas: Evidence of a Paternal Parent-of-Origin Effect. J Clin Endocrinol Metab. 2016 Jan 12. 161 (3):jc20152914. [Medline]. Waickus CM, de Bustros A, Shakil A. Recognizing factitious hypoglycemia in the family practice setting. J Am Board Fam Pract. 1999 Mar-Apr. 12(2):133-6. [Medline]. Redmon JB, Nuttall FQ. Autoimmune hypoglycemia. Endocrinol Metab Clin North Am. 1999 Sep. 28(3):603-18, vii. [Medline]. Eriguchi N, Aoyagi S, Hara M, et al. Nesidioblastosis with hyperinsulinemic hypoglycemia in adults: report of two cases. Surg Today. 1999. 29(4):361-3. [Medline]. Starke A, Saddig C, Kirch B, Tschahargane C, Goretzki P. Islet hyperplasia in adults: challenge to preoperatively diagnose non-insulinoma pancreatogenic hypoglycemia syndrome. World J Surg. 2006 May. 30(5):670-9. [Medline]. van Bon AC, Benhadi N, Endert E, Fliers E, Wiersinga WM. Evaluation of endocrine tests. D: the prolonged fasting test for insulinoma. Neth J Med. 2009 Jul-Aug. 67(7):274-8. [Medline]. Guettier JM, Lungu A, Goodling A, Cochran C, Gorden P. The Role of Proinsulin and Insulin in the Diagnosis of Insulinoma: A Critical Evaluation of the Endocrine Society Clinical Practice Guideline. J Clin Endocrinol Metab. 2013 Sep 30. [Medline]. Boukhman MP, Karam JM, Shaver J, et al. Localization of insulinomas. Arch Surg. 1999 Aug. 134(8):818-22; discussion 822-3. [Medline]. Hashimoto LA, Walsh RM. Preoperative localization of insulinomas is not necessary. J Am Coll Surg. 1999 Oct. 189(4):368-73. [Medline]. Liu Y, Song Q, Jin HT, Lin XZ, Chen KM. 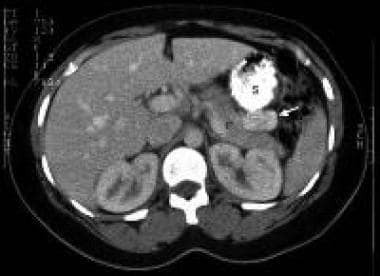 The value of multidetector-row CT in the preoperative detection of pancreatic insulinomas. Radiol Med. 2009 Sep 30. [Medline]. Zhu L, Xue H, Sun H, Wang X, Wu W, Jin Z, et al. Insulinoma Detection With MDCT: Is There a Role for Whole-Pancreas Perfusion?. AJR Am J Roentgenol. 2017 Feb. 208 (2):306-314. [Medline]. Hubalewska-Dydejczyk A, Sowa-Staszczak A, Tomaszuk M, Stefańska A. GLP-1 and exendin-4 for imaging endocrine pancreas. A review. Labelled glucagon-like peptide-1 analogues: past, present and future. Q J Nucl Med Mol Imaging. 2015 Jun. 59 (2):152-60. [Medline]. [Full Text]. Sowa-Staszczak A, Trofimiuk-Müldner M, Stefańska A, Tomaszuk M, Buziak-Bereza M, Gilis-Januszewska A, et al. 99mTc Labeled Glucagon-Like Peptide-1-Analogue (99mTc-GLP1) Scintigraphy in the Management of Patients with Occult Insulinoma. PLoS One. 2016. 11 (8):e0160714. [Medline]. [Full Text]. Christ E, Wild D, Forrer F, Brändle M, Sahli R, Clerici T, et al. Glucagon-Like Peptide-1 Receptor Imaging for Localization of Insulinomas. J Clin Endocrinol Metab. 2009 Oct 9. [Medline]. Luo Y, Pan Q, Shao Y, Yu M, Wu W, Xue H, et al. Glucagon-like Peptide-1 Receptor PET/CT with 68Ga-NOTA-exendin-4 for Detecting Localized Insulinoma: a Prospective Cohort Study. J Nucl Med. 2016 Jan 21. [Medline]. Wild D, Christ E, Caplin ME, et al. Glucagon-like peptide-1 versus somatostatin receptor targeting reveals 2 distinct forms of malignant insulinomas. J Nucl Med. 2011 Jul. 52(7):1073-8. [Medline]. Arnold R, Simon B, Wied M. Treatment of neuroendocrine GEP tumours with somatostatin analogues: a review. Digestion. 2000. 62 Suppl 1:84-91. [Medline]. Tirosh A, Stemmer SM, Solomonov E, Elnekave E, Saeger W, Ravkin Y, et al. Pasireotide for malignant insulinoma. Hormones (Athens). 2016 Apr. 15 (2):271-6. [Medline]. Keymeulen B, Bossuyt A, Peeters TL, Somers G. 111In-octreotide scintigraphy: a tool to select patients with endocrine pancreatic tumors for octreotide treatment?. Ann Nucl Med. 1995 Aug. 9(3):149-52. [Medline]. FDA approves new treatment for certain digestive tract cancers. U.S. Food & Drug Administration. Available at https://www.fda.gov/NewsEvents/Newsroom/PressAnnouncements/ucm594043.htm. January 26, 2018; Accessed: January 30, 2018. Strosberg J, El-Haddad G, Wolin E, Hendifar A, Yao J, Chasen B, et al. Phase 3 Trial of 177Lu-Dotatate for Midgut Neuroendocrine Tumors. N Engl J Med. 2017 Jan 12. 376 (2):125-135. [Medline]. [Full Text]. Bourcier ME, Sherrod A, DiGuardo M, Vinik AI. Successful control of intractable hypoglycemia using rapamycin in an 86-year-old man with a pancreatic insulin-secreting islet cell tumor and metastases. J Clin Endocrinol Metab. 2009 Sep. 94(9):3157-62. [Medline]. Bernard V, Lombard-Bohas C, Taquet MC, Caroli-Bosc FX, Ruszniewski P, Niccoli-Sire P, et al. Efficacy of Everolimus in Patients with Metastatic Insulinoma and Refractory Hypoglycemia. Eur J Endocrinol. 2013 Feb 7. [Medline]. Limmer S, Huppert PE, Juette V, Lenhart A, Welte M, Wietholtz H. Radiofrequency ablation of solitary pancreatic insulinoma in a patient with episodes of severe hypoglycemia. Eur J Gastroenterol Hepatol. 2009 Sep. 21(9):1097-101. [Medline]. Mele C, Brunani A, Damascelli B, Tichà V, Castello L, Aimaretti G, et al. Non-surgical ablative therapies for inoperable benign insulinoma. J Endocrinol Invest. 2017 Jul 28. [Medline]. Dąbkowski K, Gajewska P, Walter K, Londzin-Olesik M, Białek A, Andrysiak-Mammos E, et al. Successful EUS-guided ethanol ablation of insulinoma, four-year follow-up. Case report and literature review. Endokrynol Pol. 2017. 68 (4):472-479. [Medline]. Lo CY, Lam KY, Fan ST. Surgical strategy for insulinomas in multiple endocrine neoplasia type I. Am J Surg. 1998 Apr. 175(4):305-7. [Medline]. Fernandez Ranvier GG, Shouhed D, Inabnet WB 3rd. Minimally Invasive Techniques for Resection of Pancreatic Neuroendocrine Tumors. Surg Oncol Clin N Am. 2016 Jan. 25 (1):195-215. [Medline]. Dexter SP, Martin IG, Leindler L, et al. Laparoscopic enucleation of a solitary pancreatic insulinoma. Surg Endosc. 1999 Apr. 13(4):406-8. [Medline]. Grant CS. Surgical aspects of hyperinsulinemic hypoglycemia. Endocrinol Metab Clin North Am. 1999 Sep. 28(3):533-54. [Medline]. Bosman FT, Carneiro F, Hruban RH, Theise ND. World Health Organization Classification of Tumours of the Digestive System. Lyons, France: IARC; 2010. Rindi G, Klöppel G, Alhman H, et al., European Neuroendocrine Tumor Society (ENETS). TNM staging of foregut (neuro)endocrine tumors: a consensus proposal including a grading system. Virchows Arch. 2006 Oct. 449 (4):395-401. [Medline]. [Full Text]. Rindi G, Klöppel G, Couvelard A, Komminoth P, Körner M, Lopes JM, et al. TNM staging of midgut and hindgut (neuro) endocrine tumors: a consensus proposal including a grading system. Virchows Arch. 2007 Oct. 451 (4):757-62. [Medline]. [Full Text]. [Guideline] National Comprehensive Cancer Network. NCCN Clinical Practice Guidelines in Oncology: Neuroendocrine Tumors. NCCN. Available at http://www.nccn.org/professionals/physician_gls/pdf/neuroendocrine.pdf. Version 3.2017 — June 13, 2017; Accessed: October 3, 2017. Edge SB, Byrd DR, Compton CC, et al. AJCC Cancer Staging Manual. 7th Ed. New York: Springer; 2010. [Guideline] Öberg K, Knigge U, Kwekkeboom D, Perren A, ESMO Guidelines Working Group. Neuroendocrine gastro-entero-pancreatic tumors: ESMO Clinical Practice Guidelines for diagnosis, treatment and follow-up. Ann Oncol. 2012 Oct. 23 Suppl 7:vii124-30. [Medline]. [Full Text]. [Guideline] Ramage JK, Ahmed A, Ardill J, et al, UK and Ireland Neuroendocrine Tumour Society. Guidelines for the management of gastroenteropancreatic neuroendocrine (including carcinoid) tumours (NETs). Gut. 2012 Jan. 61 (1):6-32. [Medline]. [Full Text]. [Guideline] Kunz PL, Reidy-Lagunes D, Anthony LB, Bertino EM, Brendtro K, Chan JA, et al. Consensus guidelines for the management and treatment of neuroendocrine tumors. Pancreas. 2013 May. 42 (4):557-77. [Medline]. [Full Text]. Moscetti L, Saltarelli R, Giuliani R, et al. Intra-arterial liver chemotherapy and hormone therapy in malignant insulinoma: case report and review of the literature. Tumori. 2000 Nov-Dec. 86(6):475-9. [Medline]. Smith MC, Liu J, Chen T, et al. OctreoTher: ongoing early clinical development of a somatostatin- receptor-targeted radionuclide antineoplastic therapy. Digestion. 2000. 62 Suppl 1:69-72. [Medline]. Gonzalez-Gonzalez A, Recio-Cordova JM. Liver metastases 9 years after removal of a malignant insulinoma which was initially considered benign. JOP. 2006. 7(2):226-9. [Full Text]. Wiesli P, Uthoff H, Perren A, et al. Are biochemical markers of neuroendocrine tumors coreleased with insulin following local calcium stimulation in patients with insulinomas?. Pancreas. 2011 Oct. 40(7):995-9. [Medline]. Begu-Le Corroller A, Valero R, Moutardier V, Henry JF, Le Treut YP, Gueydan M. Aggressive multimodal therapy of sporadic malignant insulinoma can improve survival: A retrospective 35-year study of 12 patients. Diabetes Metab. 2008 Jun 13. [Medline]. Yao JC, Evans DB. Pancreatic endocrine tumors. De Vita V, Lawrence T, Rosenberg S. De Vita, Hellman, and Rosenberg's Cancer. Principles and Practice of Oncology. 10th ed. Philadelphia, PA: Wolters Kluwer Health; 2015. 1205-17. Faggiano A, Mansueto G, Ferolla P, Milone F, del Basso de Caro ML, Lombardi G, et al. Diagnostic and prognostic implications of the World Health Organization classification of neuroendocrine tumors. J Endocrinol Invest. 2008 Mar. 31(3):216-23. [Medline]. Crippa S, Zerbi A, Boninsegna L, Capitanio V, Partelli S, Balzano G, et al. Surgical management of insulinomas: short- and long-term outcomes after enucleations and pancreatic resections. Arch Surg. 2012 Mar. 147 (3):261-6. [Medline]. [Full Text]. Endoscopic ultrasonography in a patient with an insulinoma. The hypoechoic neoplasm (arrows) is seen in the body of the pancreas anterior to the splenic vein (SV) (Rosch, 1992). Disclosure: Received honoraria from Novartis for speaking and teaching.